Another mildly interesting European electronic album. And this is just very mildly interesting. It is clearly not meant for dancing, but then the music is too repetitive for it to be meant for much else. So it just becomes blah. It's kind of trying to be some kind of more sensitive IDM but it ends up being boring music. Of course you'll probably know most of the tracks from commercials or background music to some TV show or some chillout bar somewhere. Actually, now that I think about it, this does sound like music that was made in order to be licensed, I think that is the market they are going for. They saw people like Moby and Air getting all these licensing deals and wanted to get into the bandwagon. 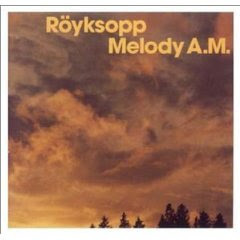 The difference is Moby and Air did not set out to have immediately appealing music without much depth ripe for licensing... Röyksopp seems like they aimed right at it. Songs from this album have been used in television adverts and computer games, "Remind Me" was formally featured in an advertisement for GEICO Insurance in one of their popular 'Caveman' ads, "Eple" was licensed by Apple and used as the introduction music for the Mac OS X v10.3 Setup Assistant. A remix of "Poor Leno" was featured in the SSX 3 soundtrack.